Whatever the occasion, nothing brings people together like inspired food & drink prepared with care, service with a smile and great company. Let the team at Showcase Restaurant & Bar create a truly memorable experience for you and your guests, whatever the occasion may be. Close to the bar, this is a perfect spot for a casual lunch, after work drinks or a social dinner. These tables accommodate up to 16 people. Select items off our regular menu to be shared or each person can order their own. To book The HIGHTOPS, please contact our Senior Restaurant Supervisor, Les Lee at Les.lee@marriott.com or 604.639.4115. A semi-private room that looks out on the restaurant, the PDR is a perfect spot to be somewhat private yet still in the heart of the restaurant. With removable seating, the PDR can accommodate standup stand-up receptions up to 40 people and seated meals for up to 27 people. 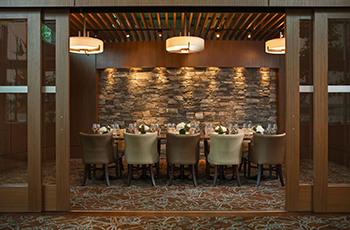 For current Private Dining Room menus please contact the restaurant directly at 604-639-4040. 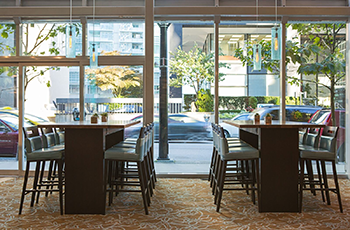 To book The PDR, please contact our Senior Restaurant Supervisor, Les Lee at Les.lee@marriott.com or 604.639.4115. A partially glassed private room above Showcase Restaurant & Bar looking down on the restaurant space. 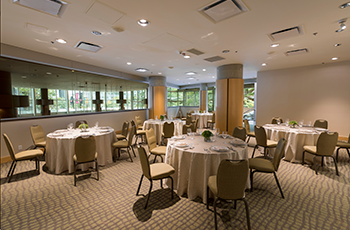 This area features space to accommodate up to 60 guests reception style and up to 40 guests for sit down meals. The LOFT is serviced by the Marriott Banquets team using the hotel catering menu. To book The LOFT, please contact the hotel Sales Team at Mhrs.yvrdt.sales@marriott.com or 604.639.4018.